Does anyone else have an almost frustratingly artistic child like my daughter, Petra? No matter if I’m trying to get her out the door to preschool or to please return to the dinner table to take a first bite already, there is just “one more thing” she wants to draw, arrange, style, direct, listen to, sing, or write. I know that urge to create will serve her well in life but ughhhh, sometimes in the moment it is a challenge to put encouragement first. Now I’ll admit that despite my keeping it together in the adulting realm most of the time, hers is my personality, too (belated apologies, mom and dad!) 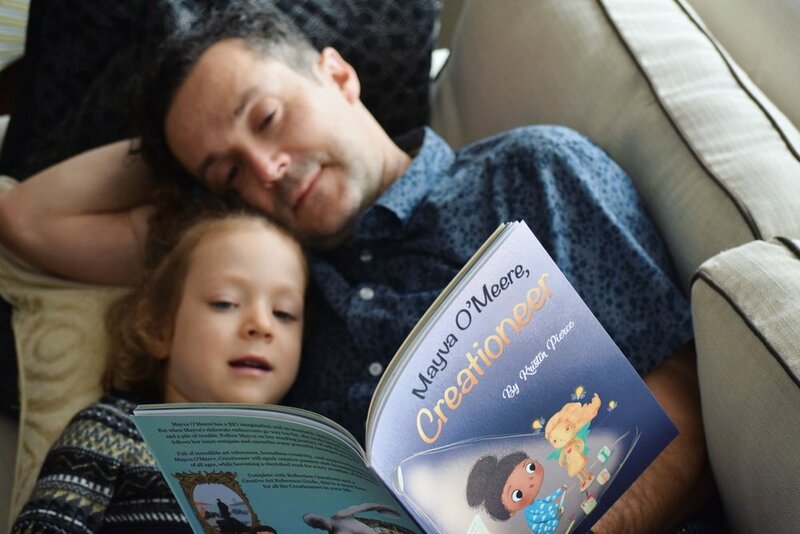 so I try to be understanding, but in Author Kristin Pierce’s new book, “Mayva O’Meere, Creationeer”, Mayva’s parents are totally right-brained and she has to learn for herself why it is she has such a calling to create. It’s a book that my daughter delighted in, no doubt seeing herself in Mayva, and I’m excited to share it with you, especially because Ms. Pierce is a local author, living just outside my home city of Saskatoon. This post contains an Amazon Affiliate link so if you end up clicking through to support this local author, I get a few cents, too. So, thanks! In my house, we are huge fans of Andrea Beaty books like “Rosie Revere, Engineer” and “Ada Twist, Scientist”; happily, “Mayva O’Meere, Creationeer” picks up in the arts where those ones leave off at science, technology, and math. Kristin Pierce’s first book, “Your Inner Compass That Could”, is about following your heart and being true to yourself even when it’s challenging, and that theme plays into the story of Mayva, who does some soul-searching of her own after her creative urges see the car painted in honey. The book is in rhymed verse which makes it a fun, easy read, but the vocabulary is elevated, which I always appreciate in a children’s book. No word is too challenging for a child when used in context. In the end, we see Mayva as a grown-up, and she’s realized her calling is not just to create art, but to create a space where others can find their calling, too. She speaks about learning from the honey-decorated car mistake she made as a child and tells that everyone is bound to make a mistake or many, but that it’s all part of the journey. Ain’t that the truth. The book also includes some reflection questions (upon which Petra is pondering above) that will help your child process the message for themselves and invite conversation, as well as an art reference guide which Petra is surprisingly into. Kristin Pierce’s “Mayva O’Meere, Creationeer” is now available in many local bookshops and via Amazon. With the countdown to Christmas on, now is the perfect time to pick it up for the little Creationeer in your life.